Another WOW page Lorraine, Loving it all. So glad you're liking it girls. Kim, 'Happiness' is an embossed silver sticker from K & Co. So is the little heart on right of pic and the swirl underneath the pic. I did the 'First Kiss' on my Robo Maria. The journalling on that one: - No matter how many kisses have come before, your first kiss as husband and wife is special, the memory of which should be treasured forever. This is going to be one fantastic wedding book, I love the mix from coloured to black and white. Another fab LO Liking the colour scheme. OMG Lorraine this is stunning. You have to start to give us the details of what you have used/how you cut bits ect. Tyey are so lucky to be getting this and Lee should be over the moon too as its so much more than a photo book that he had in mind. That lace is a bit special, yummy. aww scrumptious lace and colour and I LOVE those flowers, Nic's I mean. Arent they just so diddy and neat. Pretty lace. I like the die cut too. 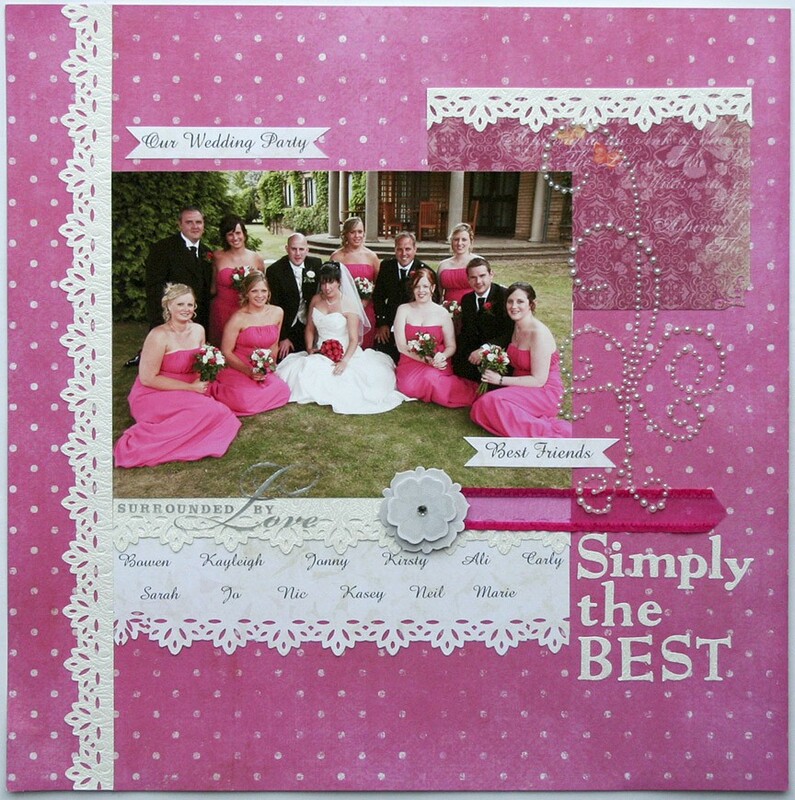 Lovely layout, great colours and love the lace. So pretty, do you have pics of yourself at that age Lorraine? She looks so like you, I'd love to see a LO with pics of you and Mia at the same age. That is a really lovely one, she is so pretty. Fab Fab Fab, and yes she is lovely. I think I do, somewhere Karelyn. I know I have a pic of me as a bridesmaid at 8 and people asked why I have a b/w pic of Nic, lol. There's a definite resemblance between the 3 of us. Next one. I've gone for a similar type of layout to Mia's page. OMG, these just keep on being SO GOOD. What a super album this is going to be. Love the one of Aidan, the grey and silver perfect for those photos. Lorraine you have to send some of these to a mag for publication, they are outstanding. aww my favourite so far is now the Mia one, I just adore the prettyness of it. This is so fab, and yes, the Aidan page goes well with it but I just adore the Mia one. keep em coming. adore those papers you have used in the aidan page .what/whose are they ? Two more beautiful pages. Love the one of Mia she's so pretty. Another lovely one, how are you going to put it all together Lorraine, some of the embellishments look very close to the edge. Some gorgeous papers you've got there Lorraine and Mia does look so cute. Kim, the papers are Kaisercrafts 'After Five'. No worries there Billie. 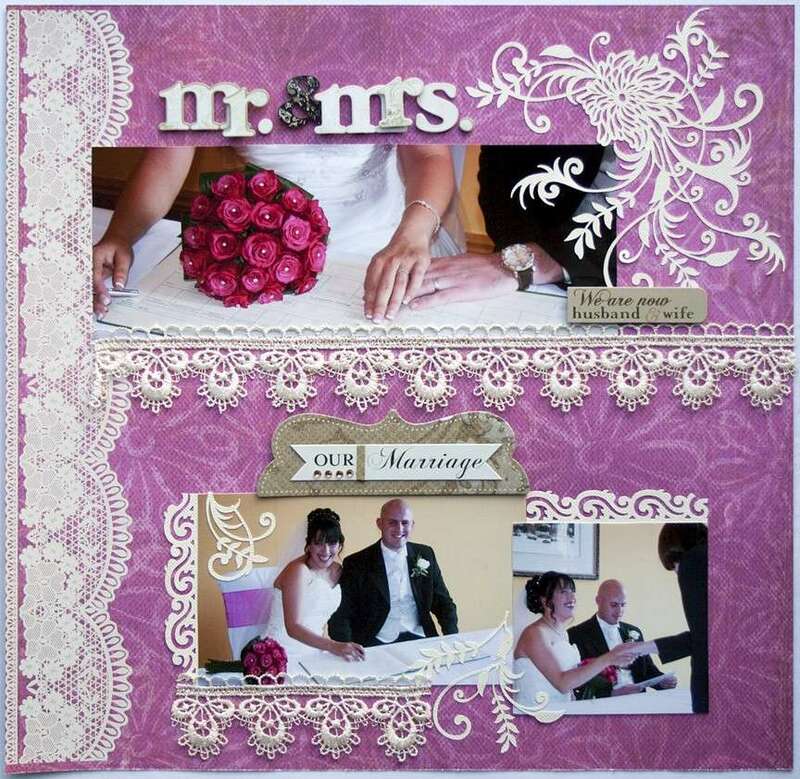 Each layout just slips into a page protector in a proper scrapbooking album. Oh thats great its going to be a lovely albumn. Made a right mess of the pearl swirl. How the hell do you get them off the acetate without ruining them? I've only managed it once. If you didn't know, you wouldn't know Lorraine, but some do seem more stuck on than others. Then they stick to themselves when you peel them off, the smaller ones are ok.